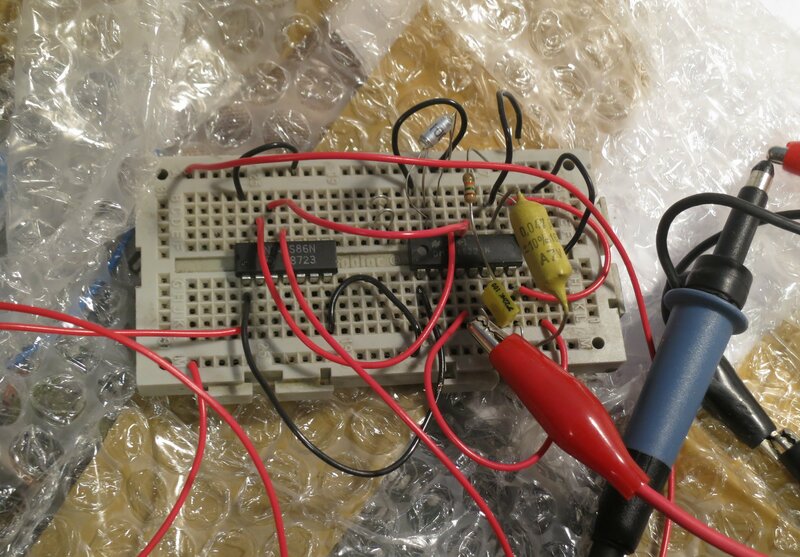 I would like to build Martin Jones's Sync Pulse Generator so that I can solder it in-line on my JAMMA harness. Seems the Sanwa PFX monitor in my NNC is not compatible with sync on some of my PCB's (mainly, the Taito F3). I am at a complete loss as to how to approach this since I have no engineering skills to speak of. This will probably be a longer than usual journey as I complete this but I would appreciate the help. IC1B and IC1C are simply the same IC, a 74LS221, correct? IC2B and IC2E are simply the same IC as well, a 74L86, correct? That is all for now. Will ask further questions as I try to make sense of the schematic myself. Thanks! The tri-sync helper should fix F3, but seem to confuse the KW0606 with CPS2. Just trying to get to the bottom of what works with what..
@acblunden2 you can pick one up from eBay or at least check which components are in play. Sanwa PFX. I think @radiantsvgun confirmed on your JVS2JAMMA thread or the NNC appreciation thread that the Sanwa PFX doesn't like tri-sync helper. I can't find the post though. Wish we could search threads on this forum. I am going to get my hands on one that was put DIY'ed later this week. Hopefully, that will let me make sense of the schematic. It's starting to make more sense the more I look at it and research. But still in the dark. Thanks caius. I know that is your site. I was thinking of paging you. But the question seemed too low-level to reach out to you yet. I'll get there though. It's starting to make more sense now. Silly question here though, do you think the schematic could have been composed better? I'm in the US. Shipping in Euros alone makes the price prohibitive. Your assumptions are correct. There's two ICs, IC1 and IC2. Guessing he spread them over two parts to simplify drawing the schematic? Also note that R1 is meant to be 6.8K and not 680R. He mentions this mistake in a comment at the end. I'll whip up a PCB for this if you like? I'll supply the necessary files, you can then order the PCBs and make life easy for yourself. Awesome, thanks so much @Frank_fjs! Doesn't need to have the switches like the eBay seller has done it. Martin Jones says it doesn't impact sync of non-impacted games so it will be wired in-line to my JAMMA harness going into the NNC as a permanent component. Let me know details as to whether you plan on making the components SMD or through-hole. I can start to build out a parts list on Digikey. I'd be inclined to use through hole, but can certainly utilise SMD if that's your preference? Schematics are good as they are.But Keep in mind this SYNC pulser is not the panacea for all issues hence some boards will still be probematic..
Through-hole is fine and easier for everyone. I am sure I won't be the only one ordering the PCB's from Osh Park. Just need the Taito F3 working with the Sanwa PFX. I have this panel I want to play the Puzzle Bobble games with on my NNC. @invzim, found the post from @radiantsvgun regarding your tri-sync helper and the Sanwa PFX. For the KW0606 at least, plain CSYNC out of a modded tri-helper works with both F3 and CPS2. The CSYNC output of the mod is not regenerated, meaning KW0606 should in theory work with the F3 with no messing about at all.. This is via the DB15 connector. I could make something, but need the facts and details on which setups have issues with what. Would be awesome if you could dig out which chassis you have. I have the Sanwa PFX (KW0606A) connected via the high-impedence 6-pin header. Don't put too much into it though. It is a rather small corner case. Martin Jone's Sync Pulse Generator will solve the problem I am having for my setup. For fun & science, you could try to connect it via the low impedance and see if it syncs - from the data I have, it should. More tooling and supplies than I am willing to invest now to check that out. Basically done. Just need to tidy up, verify connections etc. I'll move the solder pads to the edge of the board. sorry if this is a stupid question, but would something like this also help with the Taito F3 on an OSSC?